With five games left in the season, Lancaster, Pa.’s Zarek Valentin has helped his club to promotion this week. On loan from the Montreal Impact, Valentin has been a defensive stalwart for the Norwegian Adeccoligaen (First Division) leaders FK Bodø/Glimt, who clinched their return to the Tippeligaen (Elite League) with a 1-0 win over SK Vard Haugesund. Valentin has made 22 league starts with the side since going on loan at the beginning of the year, contributing to 12 shutouts (including Monday’s) for a team that has conceded only 19 goals all season. For his efforts, Valentin was also voted Man of the Match in Monday’s league winner. Meanwhile, another area native on loan has also been thriving in Scandanavia. Mechanicsburg’s Bobby Warshaw, who has been getting a lot of press in this column lately, has managed to notch another goal for Swedish side Ängelholms FF. Warshaw’s presence has had an instant impact on the team. Playing in an attacking capacity for the team (rather than the defensive roles he has grown accustomed to stateside), the goal marks his third in five leagues game and the second late game equalizer in two weeks. Bobby Convey, M, Toronto FC — Started and played 84 minutes in Saturday’s 4-1 win over D.C. Season: 22 games, 20 starts, 1 goal, 4 assists. Ryan Finley, F, Columbus Crew — Played 11 minutes in Sunday’s 4-2 win at Dallas. Season: 12 games, 3 starts, 1 goal, 1 assist. U.S. Open Cup: 0 games. Dan Gargan, D, San Jose Earthquakes — In the 18, but did not play. Season: 7 games, 5 starts, 1 assist, 1 clean sheet. U.S. Open Cup: 1 game, 1 start. Antoine Hoppenot, F, Philadelphia Union — In the 18, but did not play. Season: 26 games, 1 start, 3 goals, 1 assist. U.S. Open Cup: 1 game. Jeff Larentowicz, M, Chicago Fire — Started and played 90 minutes in Saturday’s 2-2 draw with Montreal. Season: 29 games, 28 starts, 1 goal, 4 assists. U.S. Open Cup: 3 games, 1 start. Jeff Parke, D, Philadelphia Union — Started and played 90 minutes in Friday’s 1-0 win at Kansas City. Season: 27 games, 27 starts, 8 clean sheets. U.S. Open Cup: 2 games, 2 starts. Ryan Richter, D, Toronto FC — In the 18, but did not play. Season: 14 games, 13 starts, 1 clean sheet. Canadian Championship: 2 games, 2 starts. Andrew Wenger, F, Montreal Impact — Started and played 67 minutes in Saturday’s 2-2 draw at Chicago. Season: 17 games, 8 starts, 1 goal, 3 assists. Canadian Championship: 4 games, 4 starts, 1 goal. Corey Hertzog, F, FC Edmonton — On loan from Vancouver, started and played 90 minutes in Saturday’s 1-0 loss at Atlanta. Season (Edmonton): 8 games, 8 starts, 2 goals. Season (Vancouver): 7 games, 6 starts, 1 goal, 1 assist. Canadian Championship (Vancouver): 2 games, 1 goal. Jeremy Vuolo, GK, San Antonio Scorpions — Started and played 90 minutes in Saturday’s 1-0 loss at Minnesota. Season: 8 games, 7 starts, 10 goals against. U.S. Open Cup: 0 games. Jon Okafor, M, MYPA — Played 9 minutes in Sunday’s 2-1 loss at TPS. Season: 28 games, 15 starts, 2 goals, 1 assist. Alex DeJohn, D, Ekenäs IF — Started and played 90 minutes in Sunday’s 3-3 draw with GrIFK. Season: 23 games, 23 starts, 11 clean sheets. Russell Canouse, M, Hoffenheim — No game this week. Season: 4 games, 4 starts. Zach Pfeffer, M, Hoffenheim — No game this week. Season: 1 game. 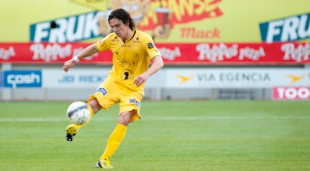 Zarek Valentin, D, FK Bodø/Glimt — Started and played 90 minutes in Monday’s 1-0 win over Vard Haugesund. Season: 22 games, 22 starts, 12 clean sheets. Cup: 3 games, 3 starts, 1 clean sheet. Bobby Warshaw, M, Ängelholms FF — On loan from FC Dallas, started and played 90 minutes in Friday’s 1-1 draw with Örgryte IS, scoring a goal in the 67th minute. Season (Ängelholms FF): 5 games, 5 starts, 3 goals. Cup (Ängelholms FF): 1 game. Season (Dallas): 8 games, 1 start. LA Galaxy played last week in Costa Rica in CCL. Greg Cochrane started and played full 90. Yes, Chris noted that in last week’s column. Cochrane has played in 2 CCl matches. Has played full 90 in both. 1st game was against team from El Salavador, @nd was last week.